What is the connection between art and democracy? This was the question at the back of my mind as I made my way to Know Your Vote and Art4All’s “Art for Democracy” workshop last Saturday. At 2:30 P.M.about a dozen people gathered at the Art Plaza outside Mumbai’s famous Jehangir Art Gallery. There were artists, political junkies like myself, college students, and the organisers from Know Your Vote and Art4All. Nikita, an intern at Know Your Vote, walked us through a short video (Credit: I Vote for India) and presentation on the importance of voting, and how voter apathy is a vicious cycle in India, in order to look at some of the traditional reasons people do not vote. The most common of these is the‘I am too small to make a difference’ syndrome – a trap that many of us fall into. But Delhi’s most recent election has perhaps proven this notion wrong. Yet, there are a myriad of other reasons that owe to low voter turnout in India, including the lack of good candidates and lack of information about candidates’ performance. If you share some of these concerns, I urge you to look at the handout below that was distributed to the participants at the workshop. It contains some useful information on how you can involve yourself in the political process. We spent some time discussing our poster ideas, and how we could mobilise the residents of our city to vote in the upcoming election. I learnt 3 simple rules to effective poster making: be concise, be clear, and connect with your audience. The message I chose was inspired from the idea that if you don’t vote, you lose your right to complain. In India, people complain endlessly about the current political system;from its corruption, to its candidates. Still, we don’t want to fulfill our basic duty as responsible citizens and vote. 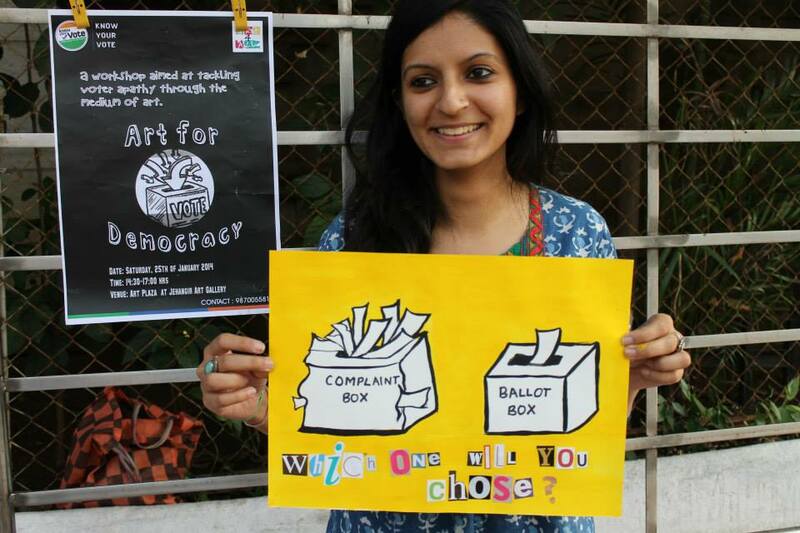 My poster depicts this dichotomy through the ‘complaint box’ and ‘ballot box: ultimately the choice is up to us. Several innovative ideas emerged through the brainstorming session, which each of us expressed using simple graphics, short messaging, and vibrant colours. As for the connection between art and democracy – let’s just say there’s more than meets the eye! It was encouraging to see several passers-by stop and ask questions about the posters and the workshop. From a six-year old boy for whom the analogy of ‘electing class monitors in school’ was used to explain the importance of democracy, to the several others who came. Their interest and support only reinforce the end goal of the workshop, which is to raise more awareness. This year’s general election in India expects close to 150 million first-time voters, a category which most of us who attended the workshop fall under.A lot hinges on how we choose to address the problems in this country. Luckily organisations like Know Your Vote and others, which are working to increase citizen engagement in the political process, are creating new avenues for us to become more aware and involved. The fact that young voters from South Bombay –a constituency that is notorious for its poor voter turnout –take timeout on a Saturday afternoon to come and spread this message tells me we are off to a good start. Mumbaikars, keep an eye out for our colourful posters, and do share them on your social media channels. You can check out the Art for Democracy album on Know Your Vote’s Facebook page. On returning to India after completing her B.A. from Tufts University in Boston, Saanya has worked on different initiatives that increase citizen engagement in India’s political discourse. She blogs about contemporary political and social issues, when she is not curled up with a book at home, or out exploring new lands. You can follow her on Twitter, at@BombayDelhi Girl. Know Your Vote on Twitter!